Dr Arvind Maheru graduated in Medicine from King’s College London. 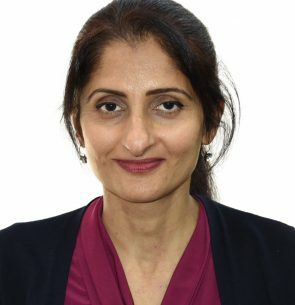 She has been a practicing psychiatrist for nearly 20 years and has worked as a Consultant Psychiatrist in the NHS with a focus on the areas of general adult, old age and liaison psychiatry. In 2005 she gained a Masters in Psychiatric Research at University College London and has completed additional training in Motivational Interviewing for health behaviour change. Life experience brought the power of whole food plant-based (WFPB) nutrition to life for Arvind. It also awakened an interest in its application to improve mental health. She and her family adopted a plant-based lifestyle in 2016 due to its multiple health benefits and she continues to advocate for a whole food plant-based diet at all stages of life. She now has a specialist interest in plant-based nutrition and Lifestyle Medicine. Arvind became a graduate of the AFMCP-UK (Applying Functional Medicine in Clinical Practice) course in 2018.